Gary, Sam & marbux of the OpenDocument Foundation contributed an extensive article to the ODF issue of Novatica-Upgrade magazine (November-December 2006). The hardcopy and early online versions came out at first in Spanish, and are now offered in PDF in English. "Interoperability: Will the Real Universal File Format please Stand Up?" John Gøtze, lecturer at Copenhagen Business School and influential member of the Open ePolicy Group, writes in the Danish online journal for IT professionals, Version2, about the OpenDocument Foundation's ODF Plugin work (which includes the ODF Plugin for MS Office, the ODF InfoSet API as well as ODF Feature-Set Wizard for OpenOffice.org). John describes Sam Hiser's disappointment about the Danish ODF policy, that it does not embrace the options organizations now have with the OpenDocument Foundation's ODF Plugin to escape the forced upgrade to Microsoft Vista and Office 2007. Gary's post covers the OpenDocument Foundation's ideas of perfect conversion fidelity developed for Massachusetts ITD's requirements. Read in extensive detail here about how the Microsoft Office Open XML format works, its built-in limitations of interoperablity and how the Foundation's da Vinci class ODF Plugin for MS Office is designed to enable the 468 million installed base of MS Office applications to work and output excellent ODF documents that can be used across different OS platforms and in different word-processing applications. Gary's post is long but edifying, covering how to add native ODF capabilities to MS Office via the OpenDocument Foundation's ODF Plugin for MS Office. Florian Reuter has started blogging. His first blog entry (14 Nov 2006) mentions his recent work background and clarifies his employment with Novell and his ongoing contributions to the work of the OpenDocument Foundation. Follow Florian's feed (RSS, Atom) for a close read on OpenOffice development going on at Novell and for detailed discussions about file format technicals going on across the OASIS technical committees where the OpenDocument specification is being developed. The Foundation's ODF Plugin permits users or administrators to set MS Word to default to the ISO OpenDocument Format (.odt). Fig. 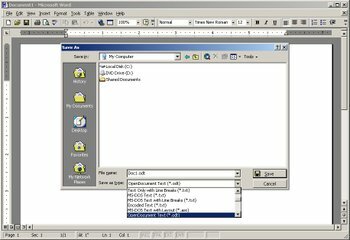 1: (Word 2003) Under Tools -> Options, Save tab in Word, you can change the default to .odt as if it were native to the application. This permits individuals & organizations to configure their PCs to open, save and work primarily in the ISO OpenDocument Format. Once the organization has safely acclimatized to working and archiving in ODF, the next step toward vendor-neutrality would necessarily require a good look at the business processes touching the desktop -- both the formal and lighter-weight, improvised or ad hoc business processes through which people get things done. The Foundation's Plugin for Word permits the user to save a text document within the Word application in the ISO OpenDocument Format (.odt). Fig. 1: (Word 2000) File -> Save As wizard now includes the .odt extension as if it were one of Microsoft's own formats (click image to expand). With the ODF Plugin installed, the user's action to save the file is as natural as if ODF were native to the Word application. The user may work within Word in the .odt format and open and save .odt files, transparently. The user or administrator may also set .odt as the default file format for Word (more screenshots soon).